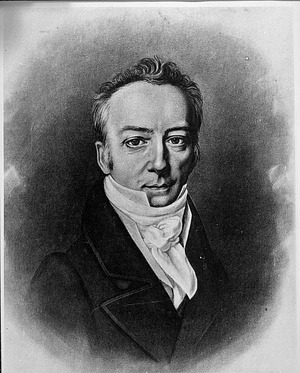 Joseph Henry considered the Smithsonian's primary mission to be the support of basic research, an area where the United States lagged.6 "There is no civilized country in the world in which less encouragement is given than in our own to original investigation," Henry wrote to his close friend and colleague Alexander Dallas Bache, just a day after his election as Secretary. 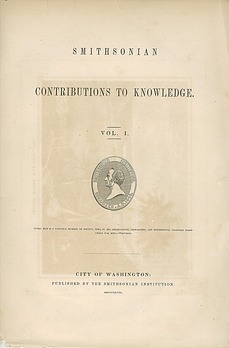 Henry's "Programme of Organization" for the Smithsonian, which he presented a year later, stated the Institution's first priority was "to stimulate men of talent to make original researches, by offering suitable rewards for memoirs containing new truths." Accordingly, no articles in physical science would be accepted for publication which did "not furnish a positive addition to human knowledge, resting on original research." Henry intended to support projects involving original research only until others could take them over. "Cooperation and not monopoly" was a phrase he frequently used to describe what he saw as the Smithsonian's ideal role as a research incubator and institutional partner.7 One of the first programs he undertook was to establish a national network of meteorological observers to supplement the Navy Department's meager and unreliable support of its own program and the Army's collection of weather data at military posts.8 In 1848, Henry offered to support the first official investigation of food quality and contamination if federal funding for the project fell through.9 A few months later, he offered to provide a small grant to the Academy of Natural Sciences of Philadelphia for natural history research by a promising young naturalist, Spencer Fullerton Baird. 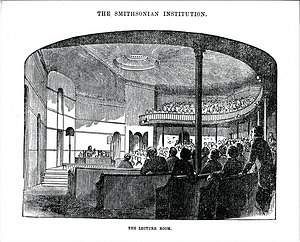 Henry asked that the formal request for funds "mention that the researches cannot be properly prosecuted unless with the aid required from the Smithsonian Institution," as justification for the grant. Henry's commitment to supporting research was carried out primarily through the Smithsonian's publication of scholarly books and articles that would otherwise "never see the light," as Henry put it.10 The Smithsonian, Henry explained, would not publish any work with "sufficient popular interest" so that its cost could be covered by sales of the work, but "if on the contrary it will not pay for itself then it ought to be published by the Institution." For geologists and natural historians, in particular, whose work often included expensive illustrations, publishing their own studies "frequently cost more than they [could] afford to expend," wrote Henry. 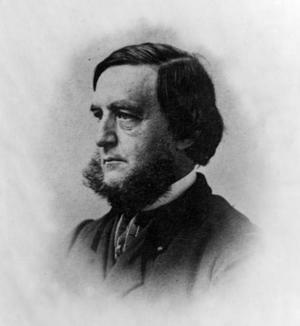 Henry felt his greatest burden as Secretary was the Smithsonian's responsibility, as mandated by Congress, for the national collections and a museum to display them.14 Shortly after his election as Secretary Henry wrote, "I would make the Institution a living establishment for the increase and diffusion of knowledge among men generally and not among those alone who happen to live in Washington or cassually [sic] visit that city." 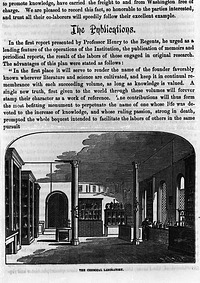 Henry also worried that the Institution could "become a mere curiosity shop"—"an omnium gatherum of the ods [sic] and end of creation"—and that its funds would quickly be depleted as a result.15 While the collections would continue to grow, the Institution's income, which derived from the annual interest on Smithson's bequest, was relatively static. 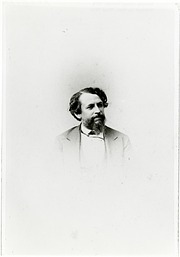 While Henry failed to rid the Smithsonian of the national collections and the National Museum, he encouraged the curatorial practice of distributing duplicate specimens to museums throughout the world.19 He also temporarily transferred the Institution's herbarium, consisting of fifteen- to twenty-thousand specimens, to the US Department of Agriculture, and sent human remains and related specimens to the Army Medical Museum in exchange for its ethnological collections.20 "The more we give away the richer we are," he wrote to botanist Asa Gray in 1870. Despite Henry's concerns about the financial demands of a museum, many members of the Board of Regents supported the museum and assistant secretary Spencer Fullerton Baird devoted his career to its development. The Smithsonian was also required to maintain a national library and an art gallery, and because Congress mandated that new publications be sent to the Smithsonian library for copyright deposit, it quickly began accumulating books. 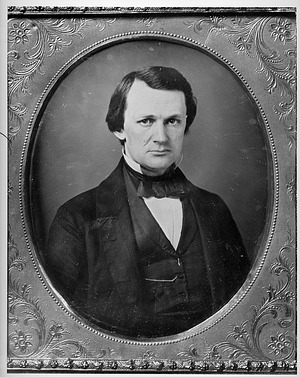 Although Henry had initially agreed to a compromise whereby half of the Smithsonian's annual income would be devoted to the library and museum, he successfully persuaded the regents to rescind the compromise in 1855. 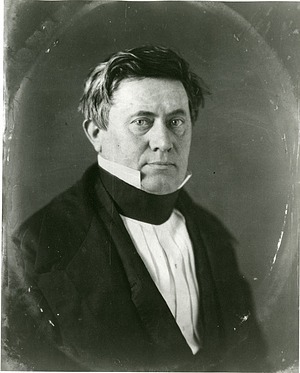 During the year leading up to the regents' decision, a public conflict erupted between Joseph Henry and the Smithsonian's librarian, Charles C. Jewett, who along with several regents believed the Institution should also serve as the national library. When Henry fired Jewett, and shortly thereafter fired another assistant over an unrelated matter, Congress conducted an investigation of Henry's actions, but exonerated him from any wrongdoing. 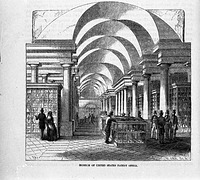 Henry set a precedent for independence from political interference during this incident, but continued to be concerned about the rapidly expanding library.21 In 1866, however, following a fire in the Smithsonian Building, he succeeded in transferring much of the library's collection to the Library of Congress. 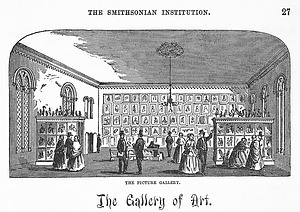 The Smithsonian's enabling act also provided for a Gallery of Art, and the Institution quickly amassed a collection of art works including portraits of important Americans and copies of classical works of art. Despite the Gallery's popularity, Henry believed it had limited or "local" impact, reaching only those who visited the nation's capital. Thus, the regents also approved Henry's transfer of the Smithsonian's art collection to the Corcoran Gallery of Art when it opened in 1874. The collection returned decades later when the courts ruled that the Smithsonian was the national gallery of art for the United States. 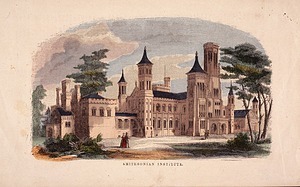 In January 1847, shortly after his election as Secretary, Joseph Henry wrote to his wife Harriett that despite having tried his best to prevent a large expenditure on an elaborate edifice to house the Smithsonian, he feared that "nothing but a large building immediately erected will satisfy the Washingtonians." Later dubbed "the Castle," the Smithsonian Institution Building was designed to evoke the cloistered, scholarly atmosphere associated with venerable English colleges. Henry, however, considered it a "fantastic and almost useless building, an "immense absorbing reservoir" of the Institution's funds, and "a sad mistake. "26 Between 1846 and 1850, some $169,000 was spent on the building and grounds, whereas Henry spent less than $18,000 on publications, research, and lectures.27 The regents attempted to preserve as much money as possible by constructing the building over a period of five years. Henry remarked that by the time it was completed, he hoped "to see generally acknowledged the gross injustice of putting the support of the museum of the government of the united states on a small fund the bequest of a foreigner for another object." In 1853, Henry wrote to English colleague J. H. Lefroy of the possibility that the government would purchase the building for a museum to house the national collections then still at the Patent Office. "If this proposition can be carried into effect," he remarked, "we shall be able to do twice as much as we are now doing for science." 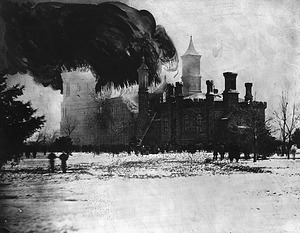 The Smithsonian's finances were further strained by the fire that struck its building in 1865. "The cost and maintenance of a building of the character which has been erected, so far from being necessary to the most efficient realization of the intentions of the founder, have been a constant source of extraneous expense," Henry wrote in the Smithsonian's annual report to Congress that year. "A single wing of the edifice is sufficient to carry on all the essential operations of the Institution," he continued. 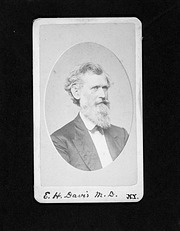 After submitting the report, he wrote to friend Nancy Clarke Fowler Bache, wife of Alexander Bache, that he was attempting "to induce Congress to rent the upper story of the main edifice for the museum of the medical Department of the army; or for the use of the Agricultural Department." Henry feared the building would "absorbe [sic] all the income, and leave nothing for the active operations to which my life has been devoted. "28 Despite Henry's concerns, the distinctive building, designed by architect James Renwick and so different from the classical buildings of the capital city, soon became the symbol of the new Institution and its dedication to the "increase and diffusion of knowledge." 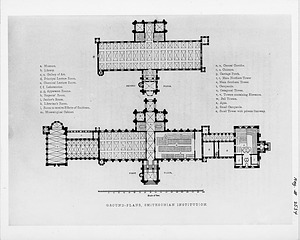 Due to his opposition to the size and design of the Smithsonian Institution Building, Henry came to an agreement with the regents that half of the Institution's annual income, which totaled around $31,000, would help fund its construction.29 In part because the money available for carrying out the Institution's programs was, therefore, quite limited, Henry micromanaged expenditures. "I am frequently vexed to learn that I am accused of meanness in the administration of the affairs of the Institution," he wrote to Yale scientist Benjamin Silliman in 1850. He went on, "I am frequently asked why do you not have more lectures. My indignant answer is—why did you demand such high towers." Henry worried, however, that after he was gone the Institution might "fall . . . under political sway." "Congress is unwilling," he wrote in 1869, "to publish anything which is not of a popular character and which the members cannot distribute among their constituents as a complimentary recognition." In 1877, he remarked on two papers he had received that were unworthy of publication, noting that after his death such articles "might be adopted by the Institution under the pressure of the authority by which they are backed." One had been presented by the secretary of war, the other by a senator.38 In its first decades, however, the Institution's scholarly independence and integrity were firmly established and maintained under his successors. Despite the challenges and setbacks he experienced in his nearly thirty-two years as the Smithsonian's first Secretary, Joseph Henry garnered tremendous respect for the Institution's work. 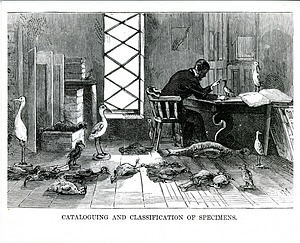 The Smithsonian became central to the growth of American science in the 19th century due to Henry's commitment to supporting the work of scientists and scientific projects that others could or would not take on. 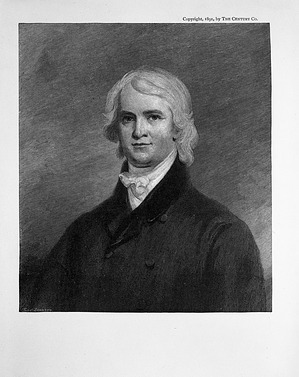 Henry failed to persuade the federal government to take control of the national collections and museum, but he was successful in convincing the Congress to provide funds to support these programs. As a result, basic research also remains an essential function of the Smithsonian, just as the Institution's founders and Joseph Henry believed it should be. Marc Rothenberg, "Joseph Henry: First Smithsonian Secretary," Smithsonian Institution Archives. Kathleen Dorman, "Joseph Henry: Public Servant," Smithsonian Institution Archives. Aly DesRochers, "Smokin’ Smithsonian," Smithsonian Institution Archives The Bigger Picture, January 24, 2012. Bibliography of Joseph Henry Resources.